Sir Fulke Conway and his successors brought over many natives of England and Wales to tenant his estates, and some of their descendants still occupy the lands. The tenantry being descended from English, Scotch, and Welshmen in general and following the customs, manners, industry, and religion of their forefathers, have always been a loyal and spirited people, much attached to their King and constitution. 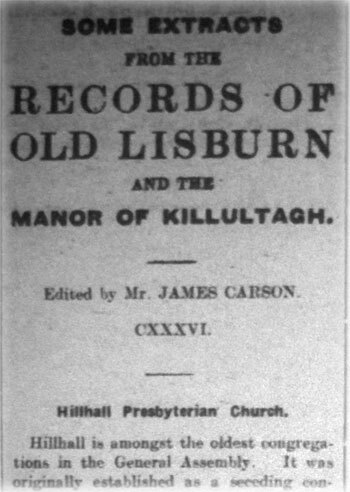 During the insurrection of the Irish against the English in the year 1642, Lisburn was besieged by the insurgents on the 28th November, an account of which is given in the vestry records of the Cathedral which was at that time a Chapel of Ease for the English troops, the Parish Church being then situated in Blaris. "Sir Phelim O'Neill and Sir Conn Magenis, the insurgent Generals then in Ulster, and Major General Plunkett having enlisted and drawn together out of the Counties of Armagh, Tyrone, Antrim, and Down, eight or ten thousand men, which were formed into eight regiments, and a troop of horse and two field pieces did rendezvous on the 27th November, 1641, at a house of Sir George Rawdon, at Brookhill, three miles from Lisburn, in which town they knew there was a garrison of five companies and Lord Conway's troop of horse. They made their attack in three divisions, at the end of Castle Street, Bow Street, and Bridge Street. More than two hundred of the insurgents were slain in Bridge Street, and three hundred in Castle Street, and in the meadows behind the houses, whereby they were so much discouraged that for almost two hours their officers could not get any more parties to adventure a second assault upon us, but in the main space they entertained us with continued fire from their body and their field pieces till about one o'clock, when fresh parties were issued out, and beaten back as before, which they supplied with others till dark, when they fired the town, which was in a few hours turned into ashes. The slain of the enemy were found to be more than thrice the number of those who fought against them. Their two Generals quit their station; their two field pieces were thrown into the river or in some moss pit and could never be found; and in their retreat or rather flight, they fired Brookhill House, and the Lord Conway library in it, and other goods to the value of five thousand pounds. All our horse, which did most execution, were not above 120 -- viz., "Lord Conway's troop, and a squadron of Lord Grandison's troop. We got about fifty of their colour and drums. They were so enraged at this defeat that they murdered many hundreds of Protestants whom they had kept prisoners in the counties of Armagh, Tyrone, etc." It was at this time Piper Hill received its name, from the head of a piper of one of the regiments being blown off and rolling down it. During the reign of Charles the First, and onward till the death of Cromwell in 1658. Ireland was torn asunder by the bloody hand of war; the Royalist, the Parliamentarian, and they native Irish, each in their own interest, tried to grasp the reins of power, till at last the iron hand of Cromwell overcame all opposition and conquered Ireland as it had never been conquered before. During these stormy scenes, Lisnagarvey being in the direct route from Carrickfergus to Dublin, bore the brunt of siege and battle several times. In 1646, after the battle of Benburb, when the Parliamentarians were defeated by O'Neill, General Monroe fled precipitately and reached Lisburn without hat, sword or cloak. Lord Conway, after having two horses' shot under him, escaped with difficulty to Newry, accompanied by Captain Burke, and about 40 horsemen. On the 6th of December, 1648, General Monroe, with the Scottish forces under his command, was signally defeated on the plains of Lisburn, near Lisnastrain, in which they lost nearly half their army and all their arms and baggage, by Colonel Venables and Sir Charles Coote. 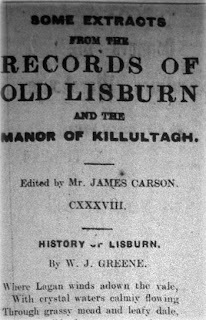 Hitherto we have had little to record of Lisburn, save an account of confiscation and warfare, but soon after this period at which we have now arrived, she became honourably identified with the peaceful pursuits of literature. Lisburn has the signal and enduring honour of being, for a considerable period, the residence of one of the greatest writers of which our noble literature can boast. The fact that in Lisburn were spent the closing years of the great Bishop-Author, Jeremy Taylor, gives our town an interest to the book-lover comparable to that which Shakespeare has conferred upon Stratford-on-Aron. This great man was born at Cambridge in 1613, where he received his elementary and university education. He duly took orders and was appointed by the famous Archbishop Laud one of his chaplains, and was thus inevitably thrown on the Royalist side. In the great Civil War this intimacy with Charles the First was so close as to merit the name of friendship, and on the ruin of the King's cause the Royal Martyr presented Taylor with his watch. During the evil days which intervened between the close of the Civil War and the Restoration, Taylor resided in Wales, under the patronage of Lord Carberry, where he produced most of his works. We find him, however, in London again in 1657-8, when he had the undesirable distinction of being imprisoned in the Tower. After his release he, in 1658, accompanied Lord Conway to Lisburn, and fixed his residence at Portmore, holding a lectureship at the former place. He ventured to London in 1660 to publish his book entitled "Ductor Dubitantium," and had the satisfaction of witnessing the triumphal entry of Charles the Second into the city on the 29th May of that year. His fortunes now revived, and he was soon appointed, through Lord Conway's influence with Charles the Second, Bishop of Down and Connor, to which was soon added the administration of the See of Dromore. In addition to the residence at Portmore, Lord Conway had fitted up for the Bishop, at Magheraleave, an exceedingly charming residence. That cottage is still to he seen there, and the study in which the prelate composed some of his later works; but how few, even of the people of our town, have visited that sacred locality. Here in the immediate neighbourhood of Lisburn there exists the rural dwelling he delighted in, and where he spent the early part of the last summer of his life. Let us hope, therefore, that some attention will be directed towards the preservation of all that renders the Bishop's study at Magheraleave one of the most interesting of local antiquities, for indeed it is a high distinction to our town that its streets were daily trodden by the author of "The Liberty of Prophesying," "Holy Living." "Holy Dying," and "The Great Exemplar." 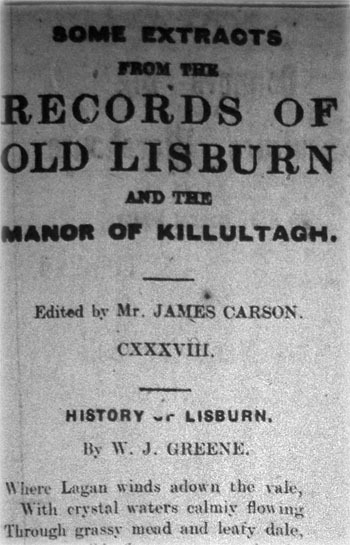 His literary activity was now checked by unfortunate disputes on the subject of conformity, but a number of his notable sermons were first preached in Lisburn. He died a victim of his disinterestedness in the pursuit of his noble calling, having contracted a fever while visiting a stricken parishioner; to which he succumbed on the 13th August, 1667. He was interred in the chancel of Dromore Cathedral, and an elegant marble slab with a suitable inscription has been erected in his remembrance by Bishop Mant, in Lisburn Cathedral. The family of Sir Fulke Conway enjoyed the territories of Killultagh until the year 1683, when Edward, the last Earl Conway, dying without issue, bequeathed them, after the decease of his Countess Ursula, to Francis Seymour, son of Sir Edward Seymour. This Francis Seymour was then a colonel to commanding the British troops in Antrim, and was a direct descendant of the younger branch of the house of Somerset. He was to have married the only daughter of Earl Conway, who had no sons. The marriage had been arranged to take place at an early date, the settlements were signed, and all the preliminaries arranged, when the lady was suddenly stricken down by disease, and died after a few days' illness on the day fixed for the celebration of the ceremony. When this melancholy event was announced, Earl Conway sent for Colonel Seymour to his bedchamber, and, after deploring the afflicting incident, told him that since it was the will of God to prevent the alliance, which he had so much at heart to see accomplished, he must still consider him his son-in-law, and heir to his estates and fortune. Colonel Seymour continued to reside at the Castle, and when Lord Conway died in 1683 he inherited his extensive territories. Almost immediately afterwards he took the name of Seymour-Conway, and in 1703 Queen Anne ennobled him by the title of Baron Conway of Ragley and Killultagh. He was three times married, and his heir was created Earl of Hertford by George the Second. From him the property descended in regular succession until the death of the fourth Marquis in 1870. From the restoration of Charles the Second in 1660 till the death of William the Third in 1702 political events happened which have had an important bearing not only throughout the world in general, but on the town and neighbourhood of Lisnagarvey in particular, and which are still bearing fruit in the civil, religious, and industrial life of the people in the present day. During the Cromwellian dynasty the inhabitants of Lisburn refused willing obedience to the Protector, of the Commonwealth, and immediately after the Restoration Charles the Second, in order to mark their loyalty to his father and himself, granted a Charter to the town enabling the people to elect two representatives to the Irish Parliament. 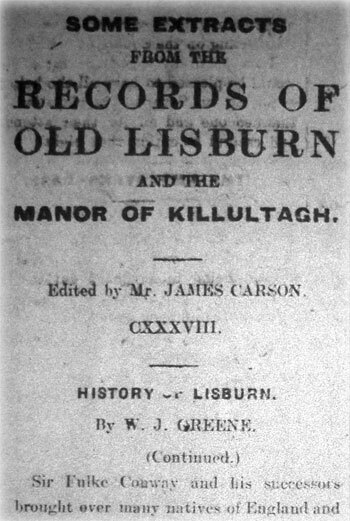 The right of election was vested in the inhabitants generally, but not being a body corporate, and consequently haying no municipal officer, the seneschal of the manor of Killultagh was appointed returning officer for the borough. His Majesty also raised the parish church to the dignity of Cathedral of Down and Connor. By the tyranny of Louis the Fourteenth of France and the revocation of the Act of Toleration, called the Edict of Nantes, on the 22nd of October, 1685, upwards of three-quarters of a million of his Protestant subjects, called Huguenots, were forced to flee from the shores of France, and became scattered abroad over most of the other nations of Europe. About six thousand fled to Ireland, many of whom settled in the town and neighbourhood of Lisnagarvey. Many of them in their native homes had been either employed in the manufacture of silk or the finer fabrics of linen, and by following these industries in their adopted country, and by bringing with them improved machinery, added greatly to the social and industrial well-being of the community. For a long period previous to the settlement of the French Colonies in Lisburn, few improvements had been introduced into the cultivation of flax, and the manufacture of linen was carried on with little regard to progress, although Lisburn and its neighbourhood had been largely colonised by men of different lands and of diversity of language. William Edmundson and his family, the first of the followers of the far-famed George Fox that had ever settled in Ulster, resided here from 1676, and had made considerable way as linen manufacturers many years before the French exiles arrived. Those also formed expert assistants in carrying cut the ideas of the new settlers, whose skill and industry were liberally encouraged by the Government, which granted large sums of money for the erection of suitable buildings for carrying on the different processes of manufacture. This soon raised the quality produced to a degree of excellence not previously known. From the admixture of so many different races sprung a people remarkable alike for their perseverance and industry. Thus in Lisnagarvey was the impulsive Celt located side by side with the quiet Quaker. In one house resided the coll-blooded[sic] Hollander, next door lived the light-hearted Frenchman, across the street were sturdy Germans, hardy Norwegians, Welsh peasants, and Warwickshire farmers, and as if to give full play to the commingling of new blood, there were also rough-looking Scottish Highlanders, flanked in by divers families originally raised in the shires of Ayr and Lanark. Lord Conway granted the French colonists in Lisburn a site for the erection of a place of worship, which was known by the distinctive term, "French Church," and stood on the ground lately occupied by the Courthouse, in Castle Street. The Government grant of £60 per annum was first paid to the Rev. Charles De La Vade, who died in May, 1755, and was succeeded by the Rev. Saumaurez Du Bour Dieu, who held it for forty-five years, when he was given the perpetual curacy of Lambeg. He was afterwards vicar of Glenavy, and died in 1812. The members of the French Church gradually merged into union with the congregation of Lisburn Cathedral, in the churchyard of which there are several monuments to the Huguenots. The View from the Railway Bridge. Make legends and traditions old to circle you still. The plain now sweetly smiling with all its golden grain. Where once had stood another3 of the days of long ago. And then it was dismantled -- "Not wanted," without doubt. With its old "three-decker" pulpit and its solid oaken door. And ten miles further over are Divis and Cave Hill. Was ever fairer country in dear old Ireland seen? Were ever farms so prosp'rous? Were ever fields so green? For if so, I may tell you, I can't find them anywhere. "Innis Garten," or "Enis Garden," now known as Ram's Island. A former stronghold of the O'Neills. Portmore, Lower Ballinderry, used to be famous for its gigantic oaks, particularly the Great Oaks, which was blown down in the year 1760. It was 14 yards in circumference and from the ground to the first branch measured 25 feet. The stem sold for £97, and a single branch sold for £9. Jeremy Taylor, Bishop of Down, Connor, and Dromore, was brought to Portmore by Lord Conway. He died in 1667. Ancient burials urns were found in 1854 and 1898 in the district between this Rath and Glenavy village. With wild flowers sweet in beauty blowing. Reflect her beauty in its waters. Lisburn or Lisnagarvey, by many esteemed the handsomest inland town in Ireland, is situate eight miles south of Belfast and one hundred north of Dublin, on the River Lagan, which divides the Counties of Antrim and Down. The town is a very old one, being anciently one of the fastnesses of Hugh MacNeil Oge, son of Neil Oge O'Neil, one of the Princes of Tirowen. Before the reign of Queen Elizabeth, Lisburn (then called Lisnagarvagh) was a small village, and is said to have taken its name from Lis-na-garvoch, the fort of the gamester, a circular rath situated on the hill on the north side of Wallace Park. It is similar to several others in the neighbourhood, and seems to have been enclosed with deep ditches, which may have been enclosed with strong palisades, a very high and thick rampart of earth and timber, and well flanked with bulwarks. There is also one on the White Mountain, another at Todd's Grove, and another on the Clogher Hills, near Plantation, in the Co. Down. It is generally believed they are the remains of the strongholds and dwelling-places of ancient Celtic Chieftains, and were so placed that signals by fire could be easily seen from one to the other. They seem to have been in use up til the year 1600 from a description of the stronghold of O'Neill, the Fort of Ennisloughlin, between Moira and Lough Neagh, in 1602. The prevailing religion was Druidic, before the introduction of Christianity by St. Patrick A.D. 432 till A.D. 465. A cromlech, supposed to be the altar on which were offered human sacrifices, is still to be seen at Giant's Ring, Ballylesson, Co. Down. The occupations of the people of Ireland generally seem to have been mainly agricultural and the rearing of cattle, when they were not fighting, which, as it appears from history, they were hardly ever free from, between some of the different septs or clans of Celt, Saxon, and Norman, who have fought at different times for possession of the country or parts of it. The weaving of linen and serge was also carried on from a very early age, the principal seats of industry being Ard Macha (Armagh), Bally-Lis, Nevan (Newtownards), and Beann-Char (Bangor). During the reign of Queen Elizabeth a very unsatisfactory state of feeling existed between the Government and the native Princes of Ulster. In those days the dynasty of the O'Neills was very powerful and no less popular throughout the northern province. Having, after several years' fighting, failed to conquer these island chieftains, the Queen tried to win them over by conciliation. An offer of an earldom was made to Shane O'Neill, but the proud chief would not accept any such favour at Her Majesty's hand. He replied that by blood and birth his rank placed him far above the peerage. "My ancestors were kings in Ulster," added the O'Neill; "they gained their power by the sword, and I shall uphold my rights by the same weapon." In the autumn of 1585 Sir Henry Sidney, the Queen's Irish Deputy, made the tour of Ulster, accompanied by an armed bodyguard of mounted soldiers, and during his journey called on the leading princes of the North. He was anxious to pay marked court to the Captain of Killultagh, one of the most popular and influential of that powerful Sept; he was the owner of a very large territory and lord of three castles, each of which was encompassed by a fort of great strength -- Ennisloughlin, near Moira; Portmore, on the borders of Lough Neagh; and the third stood on a mound that rose above the River Lagan and close to the tiny village of Lisnagarvey. The forts of that castle overlooked the entrance from the County Down side of the water, and in case of invasion was well situated for protecting the chief from every intrusion of his enemies by that route. Who looked upon the English as the "invaders of his country," did not receive the Lord Deputy with that cordial hospitality which is the traditional character of his countrymen. It is said he felt insulted by Sir Henry's mode of introducing himself, who sat on his horse outside the rampart while he sent one of the officers of his guard to announce to the Captain that the Irish Lord Deputy was outside and desired to speak with him. He indignantly refused to cross the doorway of his castle, and said, "If the English Deputy wishes to pay his respect to me I will be happy to see him inside these walls." Indignant at the reception accorded him by the Irish chieftain, Sir Henry turned away in anger from his gates and thus expressed his feelings in his report to the English Cabinet: "I came to Killultagh, which I found ryche and plentyfulle after ye manner of those countryes, but ye Captain was proude and insolent; he would not leave his castle to see me, nor had I apt reason to vysyte him as I would. He shall be paid for this before long. I will not remain long in his debt." The Queen, on hearing of the cool contempt with which O'Neill treated her Deputy became more determined to subdue the Irish Chieftains, and three famous commanders were sent over to Ireland to put down, at any cost of men and money, the princely power of the O'Neills and that of all the other chiefs. In 1587 such overtures were made in favour of peace to the heads of clans and offers of full pardon that Brian M'Art O'Neill and his father, the Captain of Killultagh, pledged themselves and their vassals, or tenants, that they would submit to English rule. Sir John Perrott accepted the promise in the name of Her Majesty; but when Hugh O'Neill, Earl of Tirowen, once again rose against the Queen, the Captain and his son forgot their promise, and joined their kinsman's army. In 1602 an expedition under Lord Mountjoy was sent against them, who captured their Fort of Ennisloughlin, and after the most terrible sufferings endured by the adherents of O'Neill, who were compelled to seek subsistence by devouring one another, the rebellion ended by the humble submission of O'Neill to the officers of the Queen. The Lord Deputy, on the Queen's part, promised a full pardon to him and all his followers, with a new patent for his lands, except certain portions reserved for chieftains received into favour and for the use of English garrisons. At the meeting of the Council in Dublin at which O'Neill attended after his submission, where he was received according to the rank of his English title; the announcement was made of the death of Queen Elizabeth, when O'Neill was observed to suddenly burst into tears. The Irish Chieftain said he was unable to contain his grief at the loss of a mistress whose moderation and clemency had at length caused him to regard as a generous benefactress; but his enemies said that he was mortified at his own hasty submission and that he regretted that he had not held out a few days longer, when he might have benefited by the change, at least make better terms. Be that as it may, with the passing of Queen Elizabeth passed away the independence and power of the O'Neills, Earls of Tirowen, Captains of Killultagh, and the Lords of Lisnagarvagh. In the year 1604, Conn O'Neill in consideration of a pardon granted to him by King James the First, at the suit of Sir James Hamilton, consented that these lands, with others, should be granted to him by letters patent. From Sir James Hamilton they passed about the year 1609 by letters patent to Sir Fulke Conway, of Conway Castle, in Wales, one of the three officers, selected by Queen Elizabeth to carry on the war against the native princes, under the command of the Earl of Essex. The other officers were Colonel Arthur Chichester and Lieutenant-Colonel Hill, from whom the Earl of Hillsboro' family are descended. Under Sir Fulke Conway's ownership the village of Lisnagarvey was very much improved, the streets laid out in their present form, Castle Street, Bow Street, Market Square, and Bridge Street, and the Sir Fulke and his successors gave great encouragement to English and Welsh tenants to come over and settle here, which a great number did. In the reign of James the First, the Church, or Cathedral as it is now generally named, was opened for the use of Divine Service, it was then called the Church of St. Thomas, afterwards altered to Christ Church in 1662, and raised to the dignity of a Cathedral for the united diocese of Down and Connor by Royal Charter of Charles the Second, to reward the fidelity of the inhabitants of Lisburn to his father and himself. Sir Fulke Conway died without issue in 1627, when his brother, Mr. Edward Conway, succeeded to the estates. Early in the reign of Charles the First he was presented with the lands of Derrievolgie, in addition to the estates which he obtained through his predecessor, and in a short time afterwards he was raised to the peerage. About the year 1627 Lord Conway commenced to erect a castle on a picturesque hill commanding a beautiful view of the valley of the Lagan. A portion of the wall which formed the entrance is still standing on the south and east side of the public walks called the Castle Gardens. In a book of travels in Ireland, published by an English gentleman in 1636, the author says:-- "From Belfast to Linsley Garvin is about seven miles, and appears a paradise compared with any part of Scotland. Linsley Garvin is well seated, but neither the towne nor the country there about is well planted, being almost woods and moors until you come to Drommore. The town belongs to my Lord Conway, who hath there a hainsome Castle, but far short of Lord Chichester's houses. Lord Conway's garden and orchard are planted on the side of the hill on which his house is seated, at the bottom of which hill runneth a pleasant river, the Lagan, which abounds in salmon." The castle became the head of the manor. The grant of King Charles also conferred the privilege of court's leet and baron, viw of frank pledge, manorial courts for debts not exceeding two pounds sterling, a court of record every three weeks for sums not exceeding £10, a weekly market and two annual fairs, which, as our readers are aware, remain is existence till the present day. Ulster Provincial School, situated on Prospect Hill, Lisburn, was founded in consequence of a bequest made in 1764 by John Hancock, a member of the Society of Friends, and a resident in Lisburn. By his will he bequeathed the sum of £1,000 (Irish currency) to the care of four trustees, for the purpose of purchasing lands. 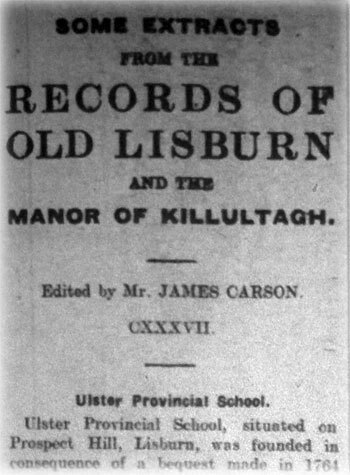 With the yearly rents and profits from those lands the trustees were to establish a school within the bounds of the Lisburn Monthly Meeting of Friends for the education of the children of members of that Society. His will also left directions for the reception of one boarder, who was to be trained as a schoolmaster. In June, 1766, Francis, Earl of Hertford, granted a lease to the aforesaid trustees of 20 acres of land for the purpose of building the said school. This lease was renewable for ever under certain conditions. John Hancock's will had expressly stipulated that no part of the money left by him should bo used for building purposes, and it is evident that owing to these stipulations difficulties arose in carrying out his bequest. As a consequence, subscriptions amounting to £1,300 were raised among the Friends of England and Ireland, and with this the original building was erected on the lands leased from the Marquis of Hertford. In 1774 this building was opened as a boarding school for the children of the Friends. Its first head master was John Gough. His "History of the People called Quakers," in four volumes, written while he was head master of the school, and published in Dublin, by Robert Jackson, in 1789, is one of the standard authorities on this subject. He also published an arithmetic, which for a large number of years held its position as a standard text book in Irish schools. John Gough died in 1791, and for some time the school seems to have been very small. In 1794 the building was considerably enlarged, and the management placed in the hands of a committee appointed by the Ulster Quarterly Meeting of the Society of Friends. It has continued practically under the same management up to the present day. One-third of the Managing Committee retire each year, but the retiring members are eligible for re-election. Large legacies and donation's come to it at various times, and considerable funds were raised for its support among the Friends, not only of Ulster, but also of Leinster, Munster, and England. From 1794 to 1875 there was little change in the educational arrangements of the school. The object aimed at was to give a sound practical English education, calculated to prepare the pupils for business and commercial life. Throughout its history very special stress has always been put upon the moral training of the pupils. Records seem to be wanting of the gentlemen who acted as head masters of the school, from the death of John Gough, in 1791, to the appointment of the late Joseph Radley, in 1875. With him the school entered upon an era of prosperity, which has continued with little intermission up to the present day. With Joseph Radley's advent the education became rather more liberal in character. In the 25 years during which he was head master the school made great strides. In 1878 the committee built the handsome front and wings, and in 1894 a fine dining-hall and gymnasium, and improved dormitory accommodation were provided. Four years later a splendid swimming bath was erected, to which a heating apparatus for the water has been added. Up to about the year 1880 the pupils admitted to the school had been exclusively Friends. It was decided, however, that its doors should be opened to receive children who were members of other denominations, and the proportion of these in the school has steadily grown. In the year 1900 Joseph Radley retired, and W. D Braithwaite, B.A. (Lond. ), B.Sc. (Lond. ), was appointed head master. Extensive changes were at once made in the curriculum and educational equipment of the school, so as to bring it into line with appeared principles of modern education, and the school definitely took its position among the principal educational establishments in Ulster. The education given was widened and deepened so as to enable its pupils to pass from the school to the university, or into the professions which do not need a university training. Its equipment for science teaching is unusually complete. This school was one of the first two or three in Ulster to have a chemical laboratory, and for the last twenty years natural science has been a strong point in its scheme of education. A new chemical laboratory was opened in 1906, which is excellently equipped. There is also a physical laboratory, lecture room, balance room, photographic room, nature study laboratory, and workshop. The site is bracing and healthy, overlooking the valley of the LAgan, and in a favourable day the view from its windows includes the Mourne Mountains in front and the Divis Hills behind. The playing fields are very extensive, including two large football fields and a cricket field for the boys, and a hockey field and tennis ground for the girls. The staff in 1906 included -- William D. Braithwaite, B.A. (Lond. ), B.Sc. (Lond), head master; Janes Woolman, B.A. (Lond. ), mathematics and science; Frederick J. Clarke, modern languages; William T. Sinclair, B.A., R.U.I., classics; Thomas Mayne, Benjamin D. Fox, David Gould, drawing; Hugh Murray, carpentry and woodwork; Winifred Green, B.Sc (Lond. ), mathematics; H. Laura Squire, Ada S. Budd, Music; Matilda Hunter, music; Margaret J. Sinton, R.U.I. ; Annie Murray, shorthand and typewriting. Frederick Bell, Parkville, Lisburn, was secretary to the school, and Joseph C. Marsh, of Belfast, chairman of the Managing Committee. W. D. Braithwaite retired in 1910, and later conducted a school in Yorkshire. He was succeeded by John Ridges, M.A., of St. John's College, Cambridge, who had been head master of Leighton Park School, Reading, a school of the Society of Friends. After a brief period the school was reorganised so as to come within the supervision of the Intermediate Board of Education for examination and inspection purposes and reap the advantages of all the various aids granted by the State for public secondary education. Technical work in science and drawing has been supplemented by similar work in manual instruction and domestic economy, These two latter subjects are placed in the hands of the expert teachers of the Lisburn Municipal Technical School. The boys are taught wood and iron work, and the girls needlework, cookery, and hygiene in that well-equipped modern school. The girls' side steadily increased in number up to 54, and the number of girl boarders reached the record of 31 in 1919, the total number of boys and girls amounting to 100. This was the number aimed at by Joseph Radley at the time of the enlargement of the school. The staff in 1919 included -- John Ridges, M.A, (Camb. ), head master; James Woodman, B.A. (Lond. ), mathematics and science, with three other assistant masters; Ada S. Budd (music), head mistress, with three assistant mistresses; David Gould, drawing; A. W. Anderton (assistant music). The County Antrim Infirmary was established at Lisburn in the year 1767, pursuant to Act of Parliament. This act allowed the governors to take or receive lands not exceeding £200. the infirmary is supported by private subscriptions and county presentments. One of the earliest surgeons was Dr. Dennis Kelly, who died in 1777; another was Dr. Stewart, a well-known physician, he was succeeded by Dr. William Thompson, who for nigh half a century occupied the post. The present surgeon, Dr. StGeorge, has now, in 1919, for over 33 years held the position with great success. Since the appointment of Dr. St. George there have been many alterations and improvements effected, and with the installation of the X-rays in the operating room -- a gift of the Barbour family -- electric lighting and a lift, it is now well equipped with all modern appliances. This is a beautiful and stately building standing convenient to the Magheraleave Road about a quarter of a mile from the town. It was erected to the memory of the late William Thompson, M.D., surgeon, to the County Antrim Infirmary for upwards of half-a-century. The cost of erection and endowment was borne by his widow, his daughter (Mrs. Bruce), and son-in-law, James Bruce, Esq., D.L. It was opened in 1885, and has ever since been a great boon as a home for aged and incurable people of both sexes, where they are provided in their declining years with every necessary comfort. This News Room was established about 1838, and met in the Assembly Rooms. It continued there for a very considerable time until circumstances arose that caused its removal to a room in Market Square. It continued there until the place was pulled down and re-built by Messrs. Todd Bros. They then removed to a room over the surgery of the late Dr. Kelso, and subsequently, after the re-building of their former domicile, they returned to the premises, over Messrs. Todd's shop. The minutes containing the records of the room during those years in a most interesting history of many of the important events happening in Lisburn during this portion of the 19th. century. After the withdrawal of the News Room from the Assembly Room, a new organisation was formed called "The Conservative News Room," and this institution existed down to the re-building of the Assembly Rooms, which was completed in the year 1889. 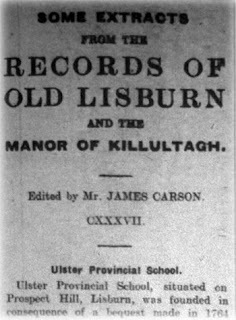 An effort was then made by the members of the Lisburn News Room to be re-instated in their old habitation on a larger and more generous basis, and the whole history of the Room was put before Sir Richard Wallace, who, after mature consideration, decided to grant the room at a nominal rent to the old Lisburn News Room, to be managed as a non-sectarian and non-political news room. At the first meeting Mr. G. B. Wilkins was elected secretary, and acted till his death. The room is equipped with two splendid billiard tables, a fine selection of papers, periodicals and magazines, chess, draughts, &c., and at one time a very good library. Besides the large room the committee secured a small room adjoining, which was formerly called the Workingmen's News Room. This is used as a reading-room. The treasurer is Mr. Thomas Malcolmson, manager of the Ulster Bank, and the secretary Mr. D. Barbour Simpson. The Temperance Institute was erected by the Lisburn Temperance Union in the year 1890. The foundation stone was laid by Mrs. John D. Barbour. The late Sir Richard Wallace, Bart, gave the site free. The cost of the buildings and furnishings was about £3,500. Of this amount the late James N. Richardson, Esq., of Lissue, first president of the Temperance Union, generously contributed upwards of £800, and collected from his friends about an equal amount. The late Rev. Joseph A. Stewart, Pond Park, and the late John D. Barbour, Esq., of Hilden, were also large contributors to the building fund. The first trustees were John D. Barbour, D.L., Hilden; James R. Boyd, Grenwood; James N. Richardson, Lissue; John Stevenson, Woodlands; Rev. Joseph A. Stewart, Pond Park. The reading-room is supplied with the leading dailies. There is also a billiard room, gymnasium, and cafe. BISHOP JEREMY TAYLOR AND KILLULTAGH. To the Editor, "Lisburn Standard." Sir, -- Referring to the interesting and informative articles by Mr. Dundas in your issue of 2nd and 9th ult., I wish to add a note extracted from the Commonwealth Council Books in the Public Record Office, Dublin, relating to Weeke, the predecessor of Dr. Taylor in Lisburn. Mr. Weeke (or Wyke) had an unsettled time in Co. Down, and in 1659 was in Donaghcloney. In that year the inhabitants of Magheralin petitioned for him to be appointed their minister, he being ready to go because a great part of the said parish consisted of Englishmen, and "ye most part of Donaghcloney (where he now officiates) consists of Papists and Scotts, who are so bound up to their owne judgments that they will not admit of any other." Mr. Weeke's controversial labours will be the better understood by reference to a detailed account of a discussion with Presbyterians at Antrim Castle given in Adair's "True Narrative," p. 186 et seq. Adair pronounces him "void of human learning, never educated that way, but a tradesman, and imprudent." Naturally Taylor would not care to act as assistant to an Independent of such a reputation. Hillhall is amongst the oldest congregations in the General Assembly. It was originally established as a seceding congregation by a few worthy Scotsmen, who settled in Lisburn about the year 1740 -- via., Snodgrass, Bittle, Patton, and Waddell. These were joined by M'Neice, M'Kee. and others from Drumbo, and by Clarke, Reid, Frazer, and M'Knight, from Largymore. After forming themselves into a congregation, they met for worship somewhere in Chapel Hill, Lisburn. In a short time after their formation they deputed two of their number to proceed to Scotland and solicit ministerial assistance from the Associated Presbytery, over which the Rev. Ebenezer Erskine then presided as Moderator. When the deputation presented their memorial it was favourably received, and ministerial aid was sent regularly to the newly-formed congregation in Lisburn. 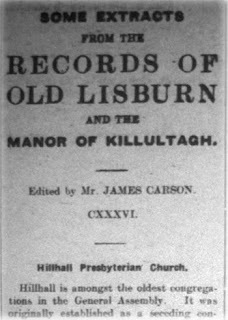 After worshipping for some time in Lisburn, and failing to obtain a site for a church in the town, they accepted the generous offer of a Mrs. Law, of Hillhall, to build a church in one of her fields, choosing the site on which the church stood that has recently been taken down, in order to erect the present handsome and substantial structure. The first church was a long thatched house, with a door at either end, and one to the middle, with an earthen floor. The church was rebuilt in 1896. the Rev. S. Dunlop being minister; it was afterwards enlarged in 1868, the Rev. J. D. Crawford then officiating. The farm of ten acres on which the Manse is erected was a gift to the congregation made by a Mr. Ross shortly after it was formed. The first minister was Rev. Mr. Greer, who was succeeded by the Rev. James Hume. The Rev. Mr. Bell succeeded Mr. Hume, and after him came Mr. Hunter, ordained on 1st March, 1796. On the 25th August, 1825, the Rev. Samuel Dunlop was ordained to succeed Mr. Hunter. After Mr. Dunlop came the Rev. J. D. Crawford, who was installed March 29th, 1866. Mr. Crawford was released from the charge of Hillhall in May, 1881. on his accepting a call to Albert Street Church, Belfast. The Rev. Robert Robson was installed by the Synod of Belfast on 2nd July, 1883. He officiated until his death on 12th October, 1906, and through his instrumentality the handsome new church, opened in August, 1903, has been erected. It contains memorial windows to the late J. D. Barbour, D.L., and Rev. S. Dunlop, a former pastor. There is also a National School, recently erected at a cost of £600, convenient to the church, of which Mr. Hunter, B.A., is principal and Miss Cupples assistant. Interim Session, 1906 -- Rev R. Robson, B.A. Committee -- Henry Bell, James Boomer, Wm.. Bowden (jun. ), Robert H. Clarke, Jas. Clarke, John Caldwell, John Downing, Jas. H. Finlay, Samuel Finlay, Jas. Gilliland (Orr's Lane), James Gilliland (Lisnatrunk), John Graham, Wm. Hamilton, James Leinster, Samuel M'Kittrick, Dr. Munce, Joseph M'Millan, John M'Nair, James Murdoch, William John Murdoch, W. J. Porter, John Reid, John Shannon, John Simpson, William Stewart, Robert Todd, Samuel Todd, Christopher Todd. Mr. Robson was succeeded by the Rev. Gilmour Neill who was ordained to the pastoral oversight of Hillhall congregation on May 8th, 1907. Mr. Neill demitted his charge in May, 1913, having accepted a call to St. Andrew's Church, Portsmouth. He acted as chaplain to his Majesty's Forces throughout the war, serving first at Portsmouth and later in France. He was wounded in June, 1918. The Rev. William M'Nutt, B.A.. the present pastor, was installed in Hillhall on August 13th, 1913, In 1915 he received a chaplain's commission in the army, and served in Gallipoli, taking park in the landing at Suvla Bay. Invalided home, he afterwards rejoined, and served in France and Belgium till the close of the war. Kirk Session, 1919 -- Rev. Wm. M'Nutt, B.A., Moderator; Dr. James Munce, clerk; Henry Bell, Robert H. Clarke. Jas. M. Harvey, Robert Simpson, William Stewart, Samuel Todd. Committee -- Jas. Boomer, Jacob Bell, W. J. Duff, James Finlay, James Frazer, John Gardiner, W. J. Gillespie, James Gilliland, William Hamilton, Samuel Lockhart, Robert Mackey, Hugh M'Clean, John M'Clenaghan, Thomas M'Connell, John Simpson, George Simpson, Samuel Taylor, Christopher Todd, Robert Turner. The original portion of the present church, with the exception of the tower, was built through the instrumentality of the Rev. Alexander Orr, in 1849. It is generally understood that the church of Lambeg is on the site of an older foundation. In Lewis' Topographical Dictionary we read: "Lambeg church occupies the site of an ancient monastery said to have been founded in the 15th century by MacDonnell for Franciscan friars of the third order. From a part of the churchyard being called the 'Nuns' Garden' it has been supposed that there was a nunnery here. The church contains mural tablets in memory of Jonathan Richardson Glenmore; George M'Comb, Lambeg; and windows to the memory of Bishop Mant and J. D. Barbour, D. L. Conway. The church was served in modern times from Lisburn, as in the churchyard is to be found the tombstone of the Rev. Saumarez Dubourdieu, for fifty years officiating clergyman of Lambeg and of the French Protestants in Lisburn. In 1810 the Rev. James Morewood was appointed to Lambeg. He obtained a lease of 14 Acres from the Marquis of Hertford and built the Rectory. Since then the Belfast Road was made, which cut off one side of the Rectory grounds, and later on the railway was made through the glebe, leaving the Rectory standing upon as angle. The Rev. John Bradshaw succeeded Mr. Morewood in 1826, and afterwards the following appointments were made:-- Rev. Robert Rowan, 1838 to 1841; Rev. Charles Lett, 1841 to 1847; Rev. Alexander Orr, 1847 to 1860; Rev. Thomas Cosgrave, 1860 to 1871; Rev. H. Percy Grubb (curate in charge), 1870 to 1871; Rev. W. Hobson, three months in 1871; Rev. W. Stewart Ross, 1872 to 1874; Rev. George Yeates, 1874 to 1877; and Rev. B. Banks, the present rector, was appointed in 1877. Churchwardens. 1906 -- J. Milne Barbour, M.A., and Adam P. Jenkins. Select Vestry -- Chas. H. Richardson, J.P.; R. Gilmour, T. Murdoch, G. Burke, Richard Crone, Joseph Frazer, H. A. M. Barbour, M.A. ; R. M'Comb, G. Long, A. Campbell, G. Robinson, Isaac Duffin. The earliest record preserved of this ancient church is a register of baptisms, marriages, and burials 1696-1778. In 1648 the church was almost destroyed during a battle between the Royalist forces and the Scots, but was afterwards rebuilt. Till 1750 the roof was of shingles. The old church was enlarged, 1813, giving accommodation for about 450 persons. The present new church was consecrated in 1872, and it is interesting to note that the flagon, chalice, and patten, of solid silver, bearing the date 1768, are still in use. The Rev. John Goyer, 1709-1738, was the first vicar whose name appears in the parochial records. Rev. Philip Johnston, vicar, 1772-1833, of Ballymacash House, reference to whom has been made, in our general history. Rev. Thomas Thompson was vicar 1836-1858. Rev. Henry Stewart, father of the Rev. Joseph A. Stewart, of Killowen, was vicar from 1858-1872. Rev. S. M. Moore, 1872-1898. The present vicar is the Rev. Charles E. Quinn, B.A. ; curate till his death -- Joseph A. Stewart, M.A. ; churchwardens, 1906 -- E. J. Charley, J.P.; Robert M'Henry: select vestry -- W. J. Boomer, Ed Sinclair, T. Brice, Joseph Waring, John MacHenry, William Boomer, R. Brown, W. MacHenry, W. MacHenry, jun. ; John Waring, Hugh Torney, and Joseph Mills. In April, 1892, a chapel of ease, recently named St. Mark's Church, was opened at Ballymacash for the convenience of the parishioners who reside in that part of the parish. Rev. Joseph A. Stewart generally officiates in the church. During the latter part of the 18th century education seems to have been in a flourishing condition in Derriaghy. Some records of the year 1794, kept in the parish church, show there were then four schools in the district. Very little more is known about the progress of education until the year 1830, when a fine schoolhouse was built adjoining the church. This school was under the control of the Church Education Society. In the year 1888 a very fine schoolhouse was erected by the Charley family, in memory of the late Miss Mary Charley, and presented to the parish. The schools were in the same year taken into connection with the National Board. The growing needs of the parish necessitated the building of a new infant school, and in the year 1897 this was accomplished. There is also a school at Ballymacash, originally build in 1790, by Rev. Philip Johnston, and afterwards rebuilt in 1833 by E. Johnston, Esq. This school has been conducted for a considerable time under the National Board Manageress, Miss Johnston, Ballymacash House.